"At long last somebody is bringing a positive solution to the economic and climate crises we face." The two ‘caravans’ toured the UK from 12-25 May 2012. Read more about climate jobs or contact climatetradeunion@gmail.com for information. Download full report here. 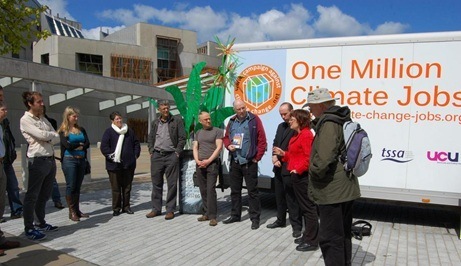 Outside the Scottish Parliament in Edinburgh, Sarah Boyack MSP (Labour), Patrick Harvie MSP (Green) and Marco Biagi MSP (Nationalist) and Des Loughney, Secretary of Edinburgh TUC addressed those assembled to wave the caravan on its way. Before leaving Edinburgh the caravan stopped in the historic Grassmarket in the centre of the city for two hours to spread its positive message. From there the northern caravan went on to Newcastle where the caravan had spent the morning engaging with many on the main shopping area. In the afternoon a meeting was held at a nearby venue where about 20 people from different organizations, including unions and local activists debated and discussed the issues raised by the caravan and the booklet on which its ideas are based, One Million Climate Jobs, produced by the Campaign against Climate Change Trade Union Group. The group agreed to set up a local CCC group to continue to campaign around these issues. Around 35 people met in Derby to discuss One Million Climate Jobs and campaigning around this theme in Derby. Speakers included the Secretary of the local Trades Council, Keith Sonnet, Deputy General Secretary of UNISON and Suzanne Jeffery, Chair Campaign against Climate Change Trade Union Group. There was a good discussion with the meeting supported by the local Trades Council. The meeting agreed to adopt a local petition calling for Climate Jobs in Derby. The following day local activists and representative for the Climate Caravan met local councillors. The MP for Derby North Chris Williamson and a number of local councillors have signed a petition calling for Climate Jobs. I want a Climate Job because… "climate change is the biggest threat to the human race – we need to tackle it." 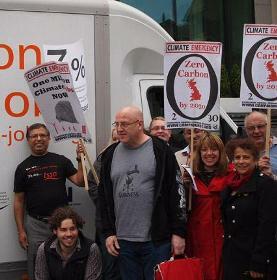 About 30 people attended the Climate Jobs Caravan meeting in Leeds. Speakers represented the Green Party, Leeds CWU union, a local campaign against the building of an incinerator, students from Leeds Metropolitan university, and local socialists. Following a wide-ranging discussion, attendees agreed to set up a campaign for 10,000 climate jobs in Leeds. There was some discussion about whether to focus on climate jobs specifically or a wider campaign for green jobs. Speakers from the floor argued that it was important to campaign for both, but it was climate jobs that would make the difference to both austerity and the environmental crisis. Our next stop was Stoke, where we were greeted by shop stewards from the PCS and by a couple of local councillors. They help us pitch camp beside a pedestrian precinct. 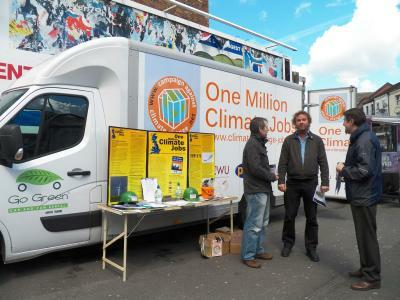 The interior of the van is converted into a mini-cinema, with the climate jobs video showing within. Outside, a large ‘political plant’ is manoeuvred into place: a wheelie bin with huge fabricated leaves and flowers emerging from it, each one painted with climate-jobs slogans, that a Mancunian artist had dreamt up and donated. The councillors help us distribute leaflets, all the while filling us in with details of the local economic blight (the decimation of the ceramics industry, the closure of the Shelton Bar steelworks) and of the sustainability initiatives that they are attempting to push forward. In conversations with passers-by we are struck by the number of people who are either unemployed or working below qualification—most memorably, a graduate in environmental science who works at a supermarket checkout. Many signatures are added to our petitions, and only an occasional ‘climate denier’ raises his head; one such imagines that ‘I bet you read the Guardian!’ is a crafty taunt. He’s right: one of us does buy that day’s Guardian. It carries a story on the implosion of the so-called ‘green deal’: according to the government’s own figures, the rate of new loft and cavity wall insulations is collapsing, by 93% and 67% respectively. I want a Climate Job because… "soon it will be too late, and where else are you gonna employ everyone?" The caravan was met in Sheffield by activists and a local folk singer who was releasing her new record about climate change to coincide with arrival of the caravan. There was a very good response to the caravan during the day which was also visited by local councillors. There was an excellent 70 plus evening meeting following time spent with the caravan in the City centre. The next morning activists held a conference on an economy for the 99%. The Liverpool event went very well. During the day we had a public "street market style" event with the climate van and a marquee where 9 local groups taking part.Joining the climate caravan stalls: PCS Union, Friends of the Earth, Liverpool Climate Action Network, Liverpool Green Party, Greenpeace, Merseyside CND, Recycles (and their bike doctor stall), Student Action for Refugees and the Merseyside Recycling & Waste Authority with the "Love Food, Hate Waste" van. We reached out to thousands of people during the day, getting many interested in the idea of climate jobs. 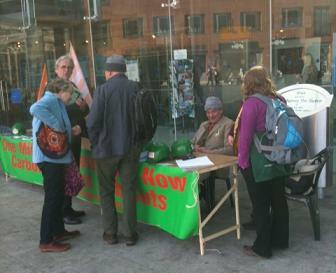 We also had dozens signing the petitions and writing messages to the government about why they "want a climate job". In the evening, we held a meeting about fracking at the Friends meeting house with 25 people attending (not too bad for a Saturday night with the football on!). We showed the film "fracking hell" followed with Philip Mitchell from Blackpool Green Party speaking and debate. We concluded the event by showing the short version of the "One million climate jobs" film introduced by John Stewart. Overall, it was brilliant, got local groups to work together, something we hope to sustain and got some of our PCS Green reps engaged. There was a very good day in Huddersfield. In the morning about half a dozen environmental and anti-cuts groups set up stalls around the caravan in Slaithwaite which finished with a short talk from me. Then a guided walk to see the solar panels installed on roofs and the opportunities for renewable energy generation and tackling fuel poverty from such initiatives. Finally an evening showing of the One Million Climate Jobs film, a talk from John Stewart and a panel discussion. The panel included the Labour leader of Kirklees Council and Cat from UKYCC and a trade unionist with around 25 in attendance. I want a Climate Job because… "climate change will not end without investment in people! The Bolton meeting was very good. It was an excellent discussion. They're going to put together a future meeting to plan activity and have some excellent campaigning ideas. Lots of DVDs and pamphlets were sold, in part because 4 or 5 contributions explained how good the pamphlet was. A union member from UNISON spoke about raising the motion for One Million Climate jobs in their union meeting and want speakers to come and talk about the issue. Earlier in the day the report from Tony who is travelling with the van is that the response in Bolton was very positive. Though there were several stories of "despair” from local young people who are unemployed and hoped we were offering actual jobs. It is the local Bolton MP who has taken the initiated the early day motion on Climate Jobs. We received an excellent response from the public throughout the day, a few people commenting that the proposals of the One Million Climate Jobs report aren't rocket science and pretty common sense stuff really. Leigh MP Andy Burnham also sent us a message saying he was very much "in support of our hard work for this important cause"
We have subsequently replied to him, thanking him for his support and to ask him to add his name to Bolton NE MP David Crausby's Early Day Motion in support of the Climate Jobs Caravan at: https://edm.parliament.uk/redirect/2012-13/65. (iii) to promote locally based initiatives across our area such as community renewable energy co-operatives, co-operative community farms & land share projects, incredible edible and other such schemes/projects, etc, which might help local communities, practically address the issues of self-reliance, sustainability and climate change locally. I want a Climate Job because… "The young generation is going to be a wasted generation and I want more for my grand children." In Blackpool, around 25 people met to discuss whether Climate Jobs could be an alternative to Fracking. Speakers from the local anti-Fracking group pointed out the dangers from Fracking, and argued that while Blackpool desperately needed more jobs, fracking was not the answer, for safety and environmental reasons. Local campaigners also discussed the potential for working together in the future, particularly over questions of fuel poverty. 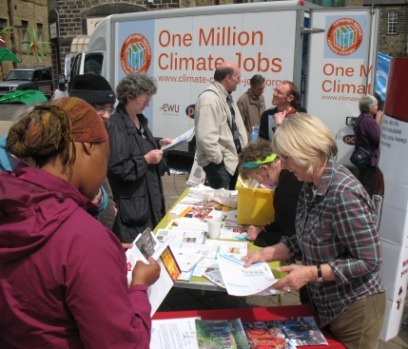 The Campaign for One Million Climate jobs visit to Lancaster culminated in a well attended public forum addressed by Martin Empson. This followed a week of other events, including two public film showings at the Dukes, a Green Jobs Fair at Lancaster and Morecambe College, and an all day event in Market Square where hundreds of people signed the national petition. There is now a core group of people locally, including trade unionists, Green Party members, and local councillors who are going to put together a local climate jobs plan for Lancaster. We have a large email list of interested people who want to be involved. We also plan to support the Zero Carbon Britain day with some imaginative activities. I want a Climate Job because… "I have a degree in outdoor & environmental education but there are no jobs in the North West." We spent most of the day with the van parked at Piccadilly gardens, quite a busy spot with plenty of people passing. Ewa and others used a megaphone to put across the arguments, and we had lots of good conversations, particularly with groups of young people, (though there were a couple of climate change deniers to be shaken off.) Many people signed the petition, most said they could not afford the pamphlet -except the ones Emma approached who all coughed up! Thank you Emma- for that and for the brilliant wheelie bin flowers. We had a good presence as fourteen people came to help at some point in the day, and we never had less than about six on and around the stall. Two of the volunteers on the day were new activists, full of enthusiasm. The only downside (apart from sunburn) was that none of the invited media turned up, so only the indefatigable photographer from the Quakers recorded the Lord Mayor and Lady Mayoress in their bling. Our two hours near the Manchester universities were less successful in that we did not have such a prominent position for the van, but students relaxing in the park after exams were mostly happy to sign the petition and some were keen to discuss graduate unemployment and the possibility of climate jobs. Our cavalcade consisted of three cyclists; Critical Mass were meeting nearby for their monthly ride round the city, but they did not join us, despite several approaches in the weeks leading up to the caravan. Some whom we spoke to said they would not ride with a fossil fuel powered vehicle - a stark illustration of the fragmentation and even hostility within the climate change and environmental movement! Thank you to all our speakers and to all who helped out during the day, specially Tony and Cat who had already driven the van to Manchester and to Liz, Ewa and Hannah who had done driving and navigating earlier in the tour. I want a Climate Job because… "I don’t want to work for the machine or make the problem worse." London the caravan was waived off on its way by supporters on a much welcome sunny day. Before the caravan departed from Parliament, John McDonnell MP, Murad Qureshi GLA member, Graham Peterson UCU, Francesca from UKYCC and Peter Colville from Occupy all pressed home the same message. Climate Jobs are an obvious and necessary way to tackle the growing climate crisis and the misery and obscenity of growing unemployment. Picking up on the Climate Job Centre theme, John McDonnell suggested that the slogan should be “Gizza Climate Job”. Before leaving London the caravan was met at Grow Heathrow by supporters who have been part of the successful campaign to stop a Third Runway at Heathrow. Climate Jobs are the alternative to work based on increasing use of fossil fuels. In Coventry the Caravan spent the day outside the national Trades Council conference. There was an excellent response from activists, many of whom took lots of leaflets and information back to their own branches. I want a Climate Job because… "I want to ensure the future of our planet is protected while developing a career that makes use of my passion and skills. This would take me off the dole and end my unemployment!!!" In Cardiff the southern caravan timed its visit to coincide with the TSSA rail union’s annual conference, parking outside the hotel and engaging with TSSA delegates and passers-by. 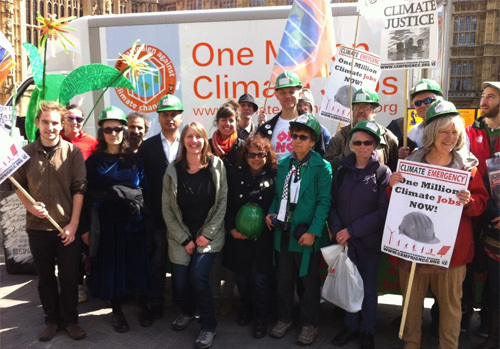 They were delighted that the Conference agreed an emergency motion to embed the Climate Jobs campaign in to union campaigning, getting the message to branches, engaging members and asking for much-needed donations. The caravan then travelled across town to Unite’s Transport House. Here a stall was set up and films were shown during the afternoon. In the evening over 40 people packed into the upstairs room of an atmospheric pub. They included a number of members of the TSSA union whose past president addressed the meeting. A positive discussion ensued. As at Newcastle, the various groups represented at the meeting agreed to try to form a network to promote the positive ideas of the caravan at a local and regional level. I want a Climate Job because… "To save what we have got for future generations." From Cardiff to Birmingham and a meeting in the splendid surroundings of Birmingham Town Hall. John Stewart spoke alongside Hanna Thomas, the Director of the Otesha Project which promotes green jobs for young in East London. Again, over 40 people from a range of organizations, including West Midlands Friends of the Earth whose well-respected coordinator, Chris Crean, chaired the meeting. The meeting included people who were doing work on practical job creation home insulation projects. At the end of the meeting the different organizations represented agreed that they wanted to coordinate their activities more closely in the future. I want a Climate Job because… "I have a degree in environmental management. I have experience as a recycling officer. 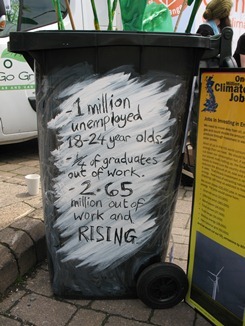 I lost my job because of cuts." The Cambridge leg of the climate caravan was a step forward for the campaign locally with three events. The van had an excellent response in the pedestrianised zone during the day with lots of visitors to the stall and 25 pamphlets being sold. A lunchtime meeting of bus users, organised by the Campaign for Better Transport and Friends of the Earth, brought together the council group leaders from both Labour and the Lib Dems alongside a climate jobs speaker. The Trades Council hosted an evening meeting with Suzanne Jeffery Chair of the Campaign against Climate Change Trade Union Group and from that a climate jobs centre is being planned for a local free festival as well as plan for a climate jobs audit to submit to the city councils local plan! We hosted a speaker event in the main square in Oxford with the Lord Mayor, other Green Party and Labour City Councillors, Representative from UK Uncut, Euro MP Catherine Bearded and Ken from the “van”. 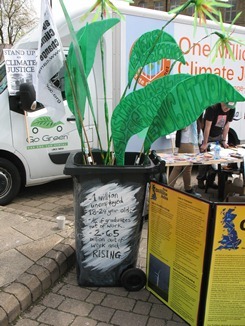 The stall/van stayed to attract passersby for an hour until moving up to Oxford Brookes Uni where Occupy had set up camp and hundreds of leaflets were put into student hands. Then back down the hill to Wadham College for a debate which made up in substance for what it lacked in numbers. Important contributions were made by Colin Tudge on the extraordinary need and capacity of the food/agricultural industry to increase the labour force, from Paul Buckingham describing the problems of the building sector in building and refitting to the quality required, Graham Peterson on the contradiction between the need for training and skills while further eduction experiences cuts, and from Ken and Josh Moos from the Campaign against Climate Change Trade Union Group. Peter Dwyer from Ruskin College then spoke about the current political situation and we enjoyed a debate between left and right (or middle, with LibDem Catherine Bearder our Euro MP) and others discussing the opportunities which might arise from the current economic crisis. We hope that other have such stimulating event inspired by the Climate Jobs Caravan. Our challenges in Oxford include greater involvement from the Unions and from the colleges of further education. Trade Unionists, Green Activists, Quakers, socialists and non-aligned others were delighted to host the Caravan at The Forum in the city centre on Thursday May 17th. There was much enthusiasm for an idea whose time has come. The evening public meeting generated an interesting 'how to' discussion, and a mailing list of people, who intend to take it further. It was noted that since Copenhagen, when 'they' were going to try to do some of what was necessary, things have changed and we can't afford it - though we can bail out the banks. We have an urgent climate crisis and a desperate need for jobs. Austerity is worsening both, the deregulated market has failed and the government response is characterised by the cut in the Feed in Tariff. A million climate jobs in the UK would lead to a stable climate and a stable economy, good long-term jobs, investment and tax base. There are local examples of pioneering projects, such as Kirklees fuel poverty reduction scheme, and Norfolk's energy supply company. We need government to follow with a national climate service. I want a Climate Job because… "it is insane so many of us are unemployed while climate change threatens the lives of millions across the globe." Richard Williams, the Labour Leader to involve the TUC in their climate change panel and a member of the audience agreed to set up a community pressure group. 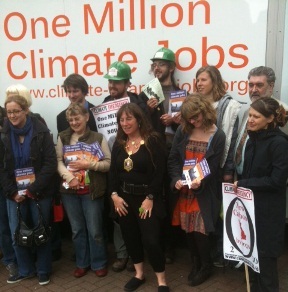 The Climate Jobs Caravan reached Portsmouth on 22nd May and spent the day in the pedestrianised shopping centre. On the street there was a good level of interest from the general public who readily accepted the idea that the government should directly employ people in climate jobs and create a national climate service. There was particular interest from those out of work and those with a memory of the formative years of the welfare state and NHS, but support was still much more general. People shared their ideas for local climate jobs projects in the Portsmouth area; these included the use of harbour marine power, wind power on Portsdown Hill and dockyard engineering skills for training and diversified manufacture. An evening meeting was attended by 15 people who included a UCU environmental rep, NUS reps, a Unison green rep, a local Lib Dem councillor, members of Portsmouth Climate Action Network, members of Portsmouth Socialist Workers Party and the general public. After talks by Suzanne Jeffery (Chair, TU Group, Campaign against Climate Change) and Hanna Thomas (Ortesha Project), an engaged discussion continued for an hour and a half. The meeting decided that future actions in Portsmouth should include: building local support for the Early Day Motion initiated by the MP for Bolton, continuing the local petition until 5000 signatures will trigger a council debate, map local industries and education providers relevant to climate jobs, engage the council to host a conference and explore opportunities to lead projects on energy efficiency and solar power (such as the projects in Wrexham), challenge the emphasis on retail for development and promote collective bargaining for community green deals. I want a Climate Job because… "We need to seriously invest in the future, forget about “defence” spending and let’s make some real positive changes for everyone’s benefit." 23 May – The Caravan in Brighton, partly for the PCS annual conference. We set-up with the van right on the promenade, in an official parking space allocated to us by Brighton City Council. The weather was glorious. Holiday-makers with ice creams mingled with the passers-by who stopped and asked questions. Especially encouraging was the number of eastern European visitors who took the pamphlets and told us about their worries about climate change. At 12.30 we held a lunch-time meeting at Sussex University hosted by their Environment Society. Our speakers were Gareth Dale, a lecturer at Brunel University, and Hanna Thomas, a former Sussex student who now oversees the Otesha Project’s East London Green Jobs Alliance. I chipped-in about the importance of students for the movement, but the best contributions came from two seasoned activists from the Labour Representation Committee who had come up to the university to support the Caravan. The day ended with an open “green fringe” meeting at the PCS conference. About 60 people attended, most of them delegates. Some inspiring speeches from, among others, Chris Baugh, PCS Assistant General Secretary, Brighton MP Caroline Lucas, and Clara Paillard, a PCS member who had organised the Caravan’s visit to Liverpool. Our own Suzanne Jeffery spoke especially well. A good day, but not untypical. I want a Climate Job because… "No planet, no nothing." The climax of the southern route of the tour was reached when the caravan arrived in London on Friday 25th May. Its first stop was the Department of Work and Pensions. A letter was handed in to the Department asking Chris Grayling, the Minister responsible, to seriously examine the message of the tour: that a million climate jobs be created to help solve the economic and environmental crises which we face. A number of the messages the caravan had picked up from around the country from people explaining why they would like a climate job were also handed into the Department. The tour ended with an evening rally in central London with a range of speakers from politics, the trade unions and from environmental and social movements. The mood was upbeat. 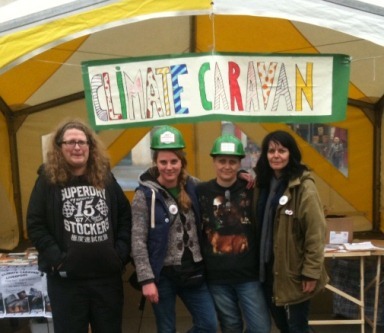 We felt that the caravan had brought a message of hope to many in near-despair, had outlined a solution which activists could unite around and fight for and had provided a real challenge to the politics of cutbacks and climate negligence. I want a Climate Job because… "I want to have a world that future generations can live in."